Ana María Ramírez and Adriana Díaz have been designing their young, trendy brand of jewelry since 2008. 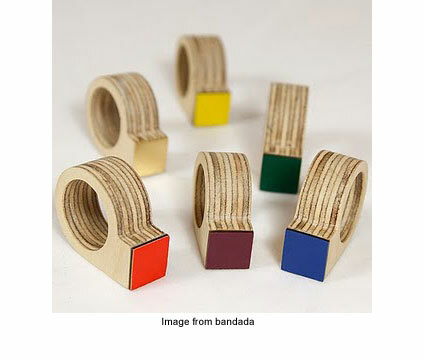 Based in Barcelona, bandada has taken inspiration from architecture around the city and designed a new line of rings called “Mirador.” Pictured above is a selection of their Mirador rings made from recycled wood. See more in their online store or read about them on their blog, cuaderno bandada.